Some comments can drive parents crazy. See if you’re guilty of saying these 4 things you shouldn’t say about other people’s children. As parents, we get a ton of comments from others, whether loved ones or strangers, about our kids. Some of these we can laugh it off, such as when we can’t help but agree. Others though need to be addressed, perhaps in defense of our kids or for thoughtlessness. The rest just drive us crazy. In most cases, people don’t say these comments with hurtful intentions, but rather as plain observations. Still, many of these comments can throw any parent off, either as offensive or flat out wrong. See if you’ve heard these comments before that should probably have been left unsaid. One of my kids has darker skin than either of his brothers or parents. Because of that, I hear a lot of comments about his skin color. No one is implying he sticks out, but why bring it up in the first place? I’m pretty sure he has no understanding of skin color or that he looks different from his brothers. But hearing how dark he is over and over throughout the years might make him feel like he doesn’t belong. In many families, one sibling doesn’t look like the others. Maybe it’s skin color, or height, or hair color, or even resemblance. If a child’s feature stands out, don’t focus so much on it. I don’t want my kids not hear how different they are, especially for something they can’t change. Maybe in the beginning, calling a baby chubby is acceptable. It’s cute, I get it. And in many cases, we want our babies to be able to gain weight, especially during those newborn days. I remember feeling scared I wouldn’t be able to take one of my twins home from the hospital because he had been born underweight. So yes, fat is good. But at a certain point, the fat talk has to stop. Don’t tease other people’s children about their weight. Avoid comments about how carrying her is a serious arm workout or that she’s bigger than her siblings. A five-year-old girl will notice that everyone seems to point out how fat she is, even if said in jest or love. One of my twins was boisterous and active as a baby. He rolled over, crawled, and walked on target. Meanwhile, his twin brother liked to lie down… a lot. On nearly every milestone, especially physical ones, he trailed his brother by a long shot. And so I heard comments about him being lazy. Even with innocent intentions, calling a child lazy is not a good message to send. Can a baby even be lazy? Babies develop at their own paces and learn in different ways. Not crawling as fast as his brother isn’t laziness, but rather a difference in growth and interest. And imagine growing up hearing you’re lazy, even as a joke—not exactly the trait you’d be proud of. Pointing out a child’s milestones, especially if they’re delayed, will make any parent defensive, worried and panicked. Avoid comparing her child to others, or ask why her child hasn’t hit certain milestones yet. He eventually will—at his own pace. We value extroverts, especially with kids. We love those who can put on a show on demand. The ones who greet every adult with a smile and an outstretched hug. The kids who will be the first to strike a conversation with others and isn’t shy about speaking up. Meanwhile, “shy” kids get a bad rap. These kids cling onto their parents for dear life at social gatherings. They may even cry or want only mom or dad to carry them. They’re not comfortable with strangers, much less feel like smiling at them. Kids need social skills, for sure, and when they’re not meeting social milestones, then yes, something could be wrong. But for most children, saying they’re not friendly or unsocial is just plain wrong. These kids are displaying stranger anxiety and strong attachments to their parents, as they should. It’s more common for a child to be “shy” than she is to be vocal and outgoing. Saying a child isn’t friendly or social makes her feel isolated and strange when most kids actually behave this way. And finally, “shyness” and introversion have their own benefits as well. These are the children who, thanks to their listening skills and empathy, tend to have many friends. Their attachment to their parents assure a strong parent-child relationship. And they often grow up to be the big thinkers and unexpected leaders in the world. These kids aren’t antisocial at all, but rather wary of new situations. Given enough time and space, they’ll warm up to their environments and feel at ease in social gatherings. But pointing out their shyness as if it’s a terrible trait isn’t going to get them there. People say these comments in jest and even with affection and love. But over time, they send the wrong message, especially to children. Kids can’t tell they’re different from others or that these differences should even matter. Hearing these comments can create internal dialogue that may not be healthy. These statements also overlook normal and healthy child development and behavior. So if you see a shy, chubby child who looks different and isn’t walking yet… hold your tongue. Neither she nor her parents need to hear you say anything. 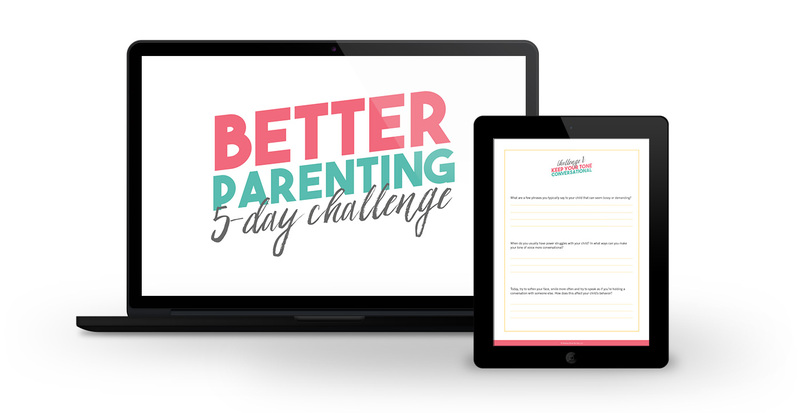 Over the course of 5 days, we’ll tackle one actionable tip per day you can implement right away that will drastically change the way you raise your child. This is your chance to challenge yourself and make the changes you’ve been meaning to make. Sign up today! Your turn: What comments have other people said about your kids that drove you crazy? Have you found yourself saying these four things? Let me know in the comments! Success! Check your email to download the bonus chapter free. I also think it is important for parents to teach their kids not to say these things. When I was in 2nd grade, I got up in my class to do show and tell. When I went to sit back down, a girl in my class said to me, “Your face was bright red up there!” I was so sensitive and self-conscious that I never got up to do show and tell again. I also avoided doing public speaking of any kind as much as possible. That one comment literally changed the course of my life. However, it seems like as I got older more and more people would point out my red face when I got embarrassed or flustered. Just annoying to hear over and over! Isn’t it crazy how seemingly little things in our lives can change its course? Don’t worry you’re not alone—lots of people get red faced! It’s just too bad that little girl had to make a big deal out of it as if it were anything strange. Oh my gosh — that happens to me, too! Another thing, someone told me once I was uncoordinated (an adult) so I never played ball sports (except for one year of softball), but I lettered every season in the other three sports I played (track, cross country, cheer). Yet, I couldn’t get that “uncoordinated” comment out of my head. Ever. Wow that’s crazy how comments we hear from childhood affects us well into adulthood! I call my 5 yr old lazy because he doesn’t want to get off the sofa to come get his snack. That’s probably not ok, right? It also drives me crazy when other people call my kids “shy” just because he/she doesn’t greet people with open arms and kisses. I mean, come on. Most adults don’t and shouldn’t do that! Instead, I try to follow-up that person’s comment with “My son/daughter just needs a few minutes.” Because everyone needs time to warm up. I’m also trying not to focus on a girl’s attire when I first greet her because then it sends the message that outward appearance is most important for girls. I hadn’t thought about complimenting a girl’s attire. I don’t think I’ve ever done that, probably for the reason you stated (subconsciously). I just didn’t think it was a big deal, unless of course it was a special occasion or something. My five-year-old suddenly started caring a LOT about what she looked like for church every Sunday, asking if perhaps we had any new dresses or hair things for her to wear, planning her attire in advance… One Sunday as I dropped her off in her Sunday School room, I heard the teacher say, “Your hair is so pretty today!” Sure enough, once I paid attention, I noticed that my daughter nearly always got complimented on her appearance at Sunday School. Her teacher was a mom of only boys and my daughter was the only girl in the Sunday School class, so I’m sure the teacher never considered the impact of her “appearance” compliments, but it sure made me more aware of how I speak to my daughter and others. Wow Sheri that’s crazy how quickly she changed to suit the compliments she was receiving. I don’t have daughters but I do the same with my nieces. I hardly compliment them for their appearances and instead focus on their accomplishments. I so agree with not focusing on a child’s clothing. Maybe especially girls but, also, boys. And I’ve also said “lazy” to my son. I haven’t said he’s lazy but that he is “being lazy” or “that was just laziness” if that makes a difference. 😉 It’s usually in reference to school work being REALLY messy because he didn’t feel like erasing it and making it legible. Thanks so much Marcia! Yeah, babies definitely elicit a lot of comments, don’t they? Definitely they need to think before they speak, at least. Yup, having more than one is just prime target for comments, especially being so close in age. I always wanted people to treat my kids individually and not always compare them. Yup, I’ve seen that with my kids too Tamara. The once outgoing child is now clinging to me, and the once taciturn child is the life of the party! I know people often say things with good intentions, but as you say, many times it isn’t received that way. For instance, if a little girl is constantly hearing “She’s so pretty!”, she may begin feeling that her appearance is her only strength. As parents, we need to make sure our children know that who they are inside is what is most important. I knew someone like that in college, Dana. All her life she heard she was pretty (and she truly was) but then that became her ‘thing.’ I think people were paying her compliments, but it ended up making her even more self conscious than any average-looking person I knew. My kids and I get comments all the time about being short. It used to really upset me as a kid, so I try to jump in when people say it to my kids. Most of the time, they just don’t think before they speak! Right, or they don’t think it’s a ‘bad’ thing to say. But say it often enough and it can make people self-conscious! Great list! I also think comparing them to their siblings or other kids is bad. My middle daughter is as tall as my oldest, which, of course, my oldest hates. Sometimes people say something like, “She’ going to be taller than you soon!” or “You got the short genes, huh?” Not cool! Thanks, Lisa! Yup, those comments would drive me (and probably my kids) crazy. I have a feeling we’re going to run into that too as I’m guessing all three of my boys will vary in height. It’s like those comments you keep hearing over and over and you’re just like, “Again?” lol. I think it’s also important to watch certain positive comments. As Dana said, a girl frequently called “pretty” may get the wrong idea about her worth. Someone often called “smart” may take that attribute on as an identity and run into trouble once the bookwork becomes more challenging. Yup Courtney—I’m always talking about not calling kids smart or other supposedly innate talents because once it gets tough, they give up when they can’t get it easily. I tell my kids instead that they worked hard. What drive me nuts is the ” your child looks very tired”. .Stopping by from Shine Blog Hop and I will be sharing this on A Bountiful Love’s page. Have a great weekend! This is so true. Kids (and adults, in my experience) rarely appreciate others pointing out superficial details that make them stand out – and why does anybody think it’s their business to comment, anyway? Yes, I don’t like it when people point out stuff about me. Even things like, “Aren’t you cold?” because I’m wearing sandals in cold weather. Definitely agree with these. I do believe that most of these comments (especially on skin tone) are made more as a recognition than a judgment; but you’ve got a good point about the longer term effects. And no, I don’t believe laziness would really apply to babies. How can someone even think of such things? I have heard someone say children are crazy. Proverbs 18:21 Death and Life are in the Power of the tongue. People should be careful of what they say. That includes myself. On one hand I can see your point about calling babies fat or chubby, but in our house, I think it’s been a good reminder to my girls that FAT IS NOT BAD. We don’t ever talk in terms of weight or even own a scale (or a TV) so I don’t know where they soak up messages about fat being bad, they just do. I tell them all the time that I love my healthy, chubby baby and I think that’s good for them to hear. That’s one way to put it! I know some other little girls who were chubbier than their sisters, and I see people point it out a LOT. It makes me sad not so much that she ought to aspire to be skinny, but that she’s being singled out (the same can also be said with girls who are skinny and are always reminded of it). Oh totally, Betsy. I feel the same about compliments as well. I wrote a whole blog post earlier on about how I don’t tell my kids they’re handsome (because everyone points it out). Same thing with being smart, athletic, etc. I’d rather they praise something they can control, like effort or working hard or not giving up. I’m guessing Mushroom says ‘no I’m not’ more because he doesn’t like the attention than actually saying he’s not handsome or clever. I know sometimes my kids don’t like being scrutinized or pointed out. I don’t either sometimes! I think it’s great that you gave intentions a place in your argument, but we can’t control what others say. I know these statements can be offensive, however it’s our job as parents to teach our kids how to respond to these offenses. I say teach your children not to say these things and then how to graciously respond when they hear them. I find if someone offends me or my child, that dealing with the offender immediately and with Grace gives my child a great example and learning opportunity. Danielle, you make a great point about modeling our responses so our kids can follow suit. I think it’s a good idea when our kids can learn how to respond themselves and know that their parents have their back. That’s right, Susan! How terrible to label someone too early in their life. I agree, people need to stop making snap judgment towards others,everyone is different. Albert Einstein didn’t talk until he was four years old, I have two children one is an extrovert and the other is an introvert, both are smart and charming in there own wa. Never compare children Adults who are insecure of themselves or there own kids tend to do it more often. Please stop! Great tips, Nina! I’m a mom of 6, with 5 girls and just 1 boy (he’s right in the middle). Sooo many people would say “I feel sorry for you, surrounded by all those girls!” I know people thought they were being cute and just joking, but because he heard it so often from countless people, he struggled for years to be content as the only boy. It’s amazing how much impact those innocent comments can have when they’re repeated on a regular basis. Oh man Kristin I can only imagine. Here you are trying to promote sibling harmony or at least not highlight being an only boy. My brother is also in the middle, but there are “only” 4 of us girls, not 5 🙂 Although in his case I think he liked being the only boy and felt he was special lol!